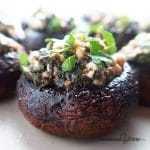 A simple spinach stuffed mushrooms recipe with feta cheese and garlic! Low carb stuffed mushrooms with spinach are easy, healthy and taste like Greek spanakopita. Spinach and feta cheese is a classic combination that’s hard to get wrong. 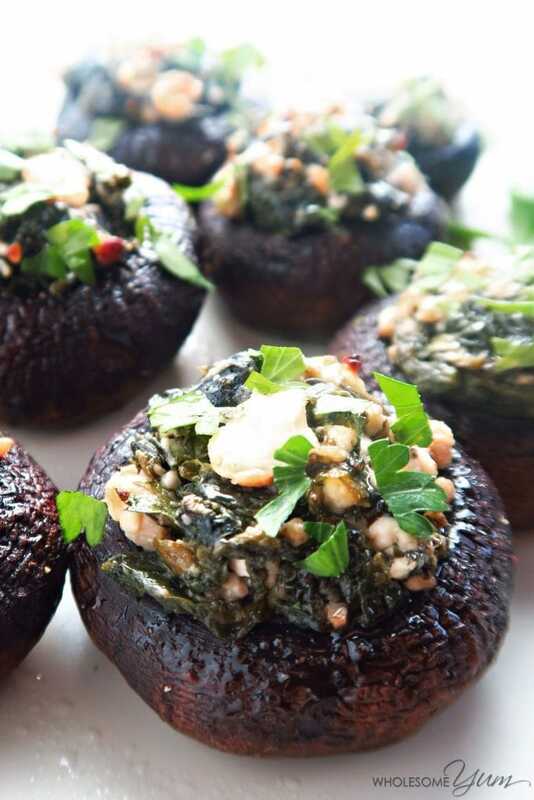 Use them to make spanakopita-inspired low carb stuffed mushrooms with spinach, and you’ve got a no carb appetizer that will please even the most finicky of eaters! Normally Greek spanakopita calls for flaky phyllo dough. But even without it, these spinach stuffed mushrooms are left with the most important flavors. And, might I add, it’s so much easier to make this low carb spanakopita of stuffed mushrooms with spinach than the traditional way! 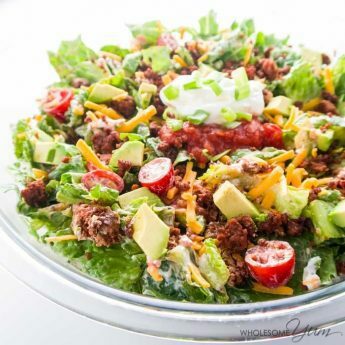 This is one of those versatile low carb appetizer recipes that can be used to make up a great weekday lunch or a fancy weekend app for an evening with friends. Regardless of when you enjoy your low carb stuffed mushrooms, you’re going to fall in love with this ease and flavors of this delightful gluten-free recipe. During my early college years, I worked as a waitress at a Greek restaurant. The owner had moved here from Santorini, a small island off the coast of Greece, and started the restaurant as a way to share his country’s authentic dishes with the people here. Why someone would move from the glistening waters and sparkling sands of Santorini to cold, boring Minnesota… I’ll never know, but I’m sure he had his reasons. And I’m really glad he did! I loved enjoying the authentic flavors of his country’s dishes… that you can now enjoy, too! The restaurant later closed, but the amazing, authentic Greek food we served there still remains a happy memory. 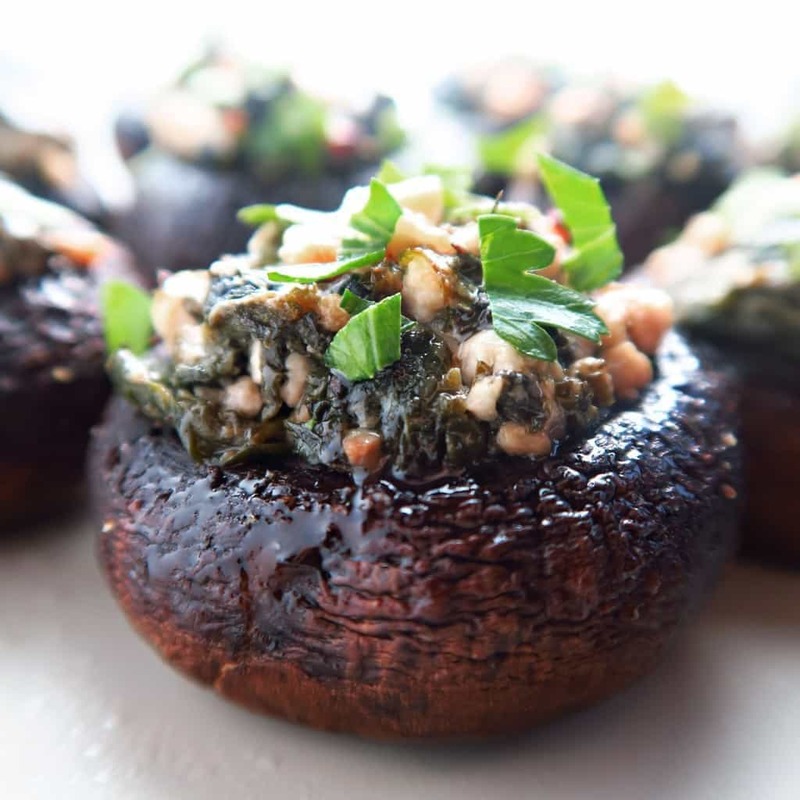 This spinach stuffed mushrooms recipe with feta cheese and garlic is a twist on one of the most popular dishes the restaurant served. For those that haven’t heard of spanakopita, they are cute little triangles of flaky phyllo crust, filled with a rich mixture of spinach and feta cheese. These days, frozen variations of the same appetizer can be found at most grocery stores and wholesale clubs. But that’s not for you if you’re here, is it? You want a healthy version of spanakopita to fulfill your cravings for it. After all, there has to be a way to enjoy low carb spanakopita, right? And there is! It turns out, spinach stuffed mushrooms are incredibly quick and easy to make. 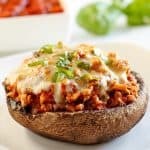 While many baby portobello mushroom recipes will have you bake the mushrooms to prep them before filling, you can just skip that step with this particular simple stuffed mushroom recipe. So, how do you put these stuffed mushrooms with spinach together? The first thing you’ll do is wilt the spinach. Don’t let this intimidate you if you’ve never done it before; you’ll just follow the instructions and use your microwave. You can also lightly saute it instead if you want to avoid the microwave. Set it aside to cool. While you stove is pre-heating and your spinach is cooling, it’s time to put together your stuffed mushrooms with spinach. Line a baking sheet with some parchment paper and place your mushrooms upside down, so the cavity is facing up to be filled. Drizzle them with oil and season with salt and pepper. 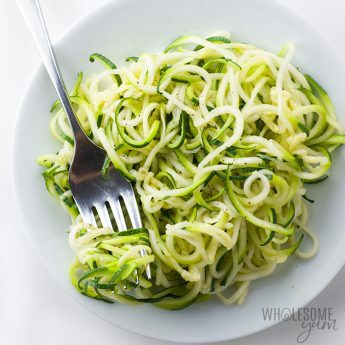 In a separate bowl, mix together the spinach, garlic, parsley, and cheese. Season with salt and pepper to taste, and then use the mix to stuff your mushrooms. I like to use a small spoon and then just a finger (or another spoon) to slide the mixture from the spoon into the mushrooms. 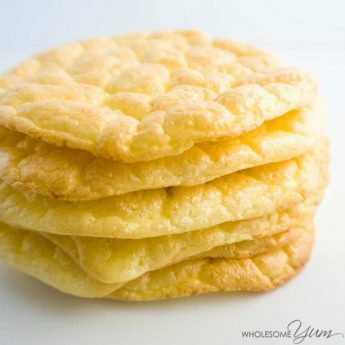 You can fill them quite full, so that they make a little mound on the top. Lastly, cook them. 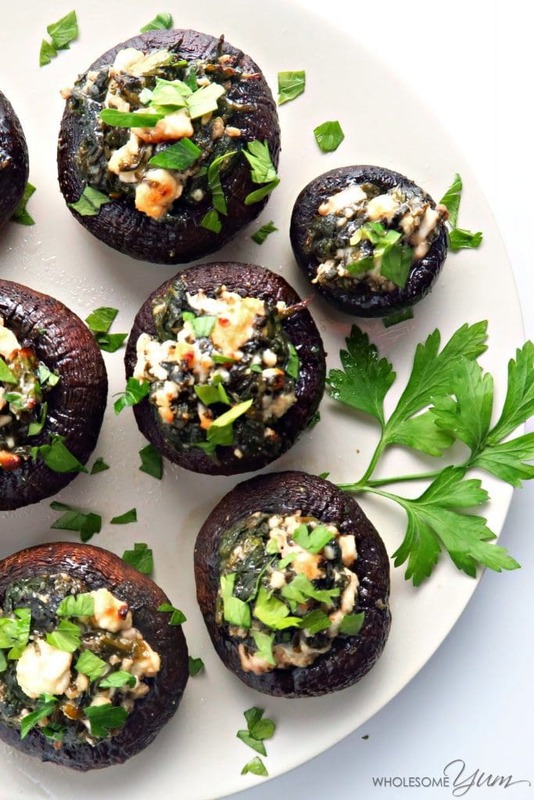 You’re going to be baking these spinach stuffed mushrooms with feta cheese at very high temps. This helps the mushrooms bake without too much liquid. However, if you end up with any on the pan while they are cooking, just drain it after. Voila! You’ve just made mouthwateringly delicious stuffed mushrooms with spinach that are so yummy that you won’t even be wondering where the flaky phyllo dough is. Can you believe it? Just remove the stems from the mushrooms, mix up the filling, stuff it into the caps, and bake. Despite the simplicity of these low carb stuffed mushrooms, they look fancy and unique. That’s the best of both worlds. Because the amount of filling is hard to predict (the amount you actually need varies based on the size of your mushroom cavities), you may have some left over. And that’s actually great news. Why? Because the filling for your spinach stuffed mushrooms can double as a delicious spread on some paleo keto bread (make 90 second bread if you’re impatient! 😉 )… or as a dip for some low carb chips. You can even dunk veggies into it. If you end up with some low carb stuffed mushrooms left over, no worries. You’ll just put them in the fridge in an airtight container to enjoy later. 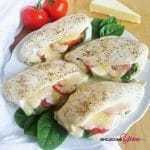 Reheat them in the oven or microwave, and drain any extra liquid that may come out. 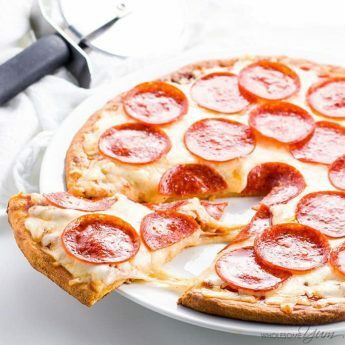 Or, plan to have extras for a nice keto friendly lunch. Seriously. 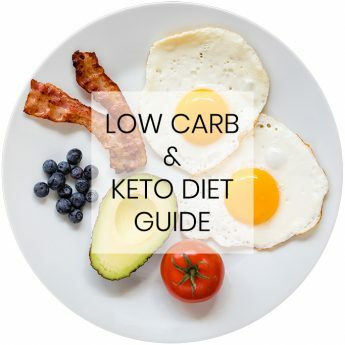 Personally, I suggest that you definitely make a double batch so that you can enjoy your low carb stuffed mushrooms throughout the week, as well. If you want to serve them fresh for a party or special occasion, you can even make up the stuffed mushrooms with spinach ahead of time and store them, uncooked, in the fridge. Another option is to flash freeze them and put them in a freezer container for use down the road. This can actually be done either before or after baking; it’s totally your choice. Then, when it’s time, just pull them out and bake them to enjoy fresh gluten-free, low carb stuffed mushrooms. You don’t even need to thaw them before baking! These appetizers would be delicious served with eggplant lasagna or on the side of a simple Greek Mason jar salad. 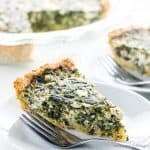 They make a wonderful addition to any low carb holiday menu plan, are great for an at home date with your loved one, or to enjoy simply because you like stuffed mushrooms with spinach, garlic, and feta. Enjoy, friends! Preheat the oven to 400 degrees F (204 degrees C). Line a baking sheet with foil or parchment paper (grease lightly if using foil). Place the spinach in a bowl with a few tablespoons of water and cover with plastic wrap. Steam in the microwave for 2 minutes, until wilted. (You can also steam the spinach on the stove if you prefer.) Drain extra water and set aside to cool. Arrange the mushrooms cavity side up on the baking sheet in a single layer. Drizzle with olive oil. Season with sea salt and black pepper. When the spinach is cool enough to handle, squeeze it tightly several times to drain as much moisture as possible. It should turn into a small, tight ball. 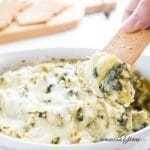 In a medium bowl, mix the spinach, feta cheese, garlic, and parsley. Add sea salt and black pepper to taste if desired. Spoon the mixture into the mushrooms. Bake for about 15-20 minutes, until the mushrooms are soft and golden. 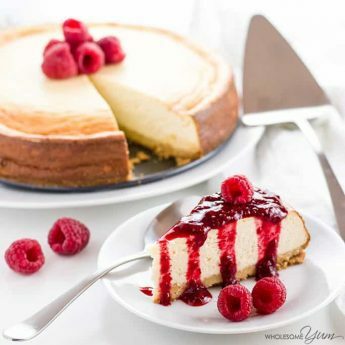 For make ahead, should I prepare and bake before freezing, or freeze and then bake just before serving? Hi Pat, You can do it either way! Both will work. We had these with dinner tonight. They are so good! Thank you, Stacey! It’s one of my favorite Greek foods. Sounds like a really delicious idea! Thank you, Kalyn! I think so too. Thank you, Chrissa! I love Greek food, too. It was definitely fun to see how all the Greek dishes were prepared! Love stuffed mushrooms, makes me feel fancy. They look yummy. Thank you, Kage! Isn’t it awesome that stuffed mushrooms look fancy, but are actually so easy? Oh my goodness, these look delicious! I adore spanakopita, but I’m trying to eat better. These definitely look like a great healthier option. Thank you, Cassie! Yes, they are the best of both worlds – you get to have your spanakopita, but they’re healthy too.